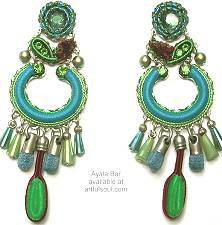 This page of Ayala Bar jewelry contains prior seasons that are now retired...LAST CALL and ON SALE! 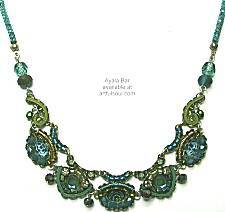 Ornate design that features green crystal at top surrounded by threaded cord. Below that is a shapely element filled by green cord and tufted fabric, the delicate fringe includes fabric element, glass and metal pieces. 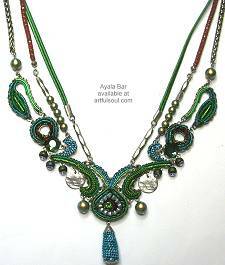 Busy with multicolor prints under glass, framed richly with tiny glass and crystal beads, some green chain, dark blue crystal, and dancing beaded fringe. 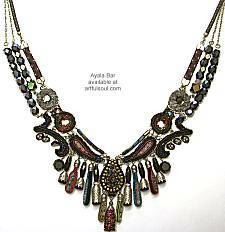 WOW necklace is dramatic both in the deep jet black accented by cranberry, teal, gray and bronze...as well as the mix of curving shapes that are joined by multiple jump rings to stay in gorgeous design. Cords and fuzzy fabric texture, strands of crystal beads mix with fabric ribbons, everything joining to metal and black mesh chains in the back. At center is the dramatic elongated fringe provided by handmade drops formed by folded fabric over interior fuzzy fabric, and the metallic fabric bead at center. Nighthawk Collection features jet black cords and fuzzy fabric accents of deep cranberry red and gray with black, bronze and a little royal purple splash, make this a dramatic collection. Not all colors appear in every item.